This is Ivy, Pippa and Rosie, Ivy is the mother of the other two, they all live together in a very big hutch. Bonny is my other rabbit, she is also a pedigree but she is a Rex rabbit. She is more outgoing than Ivy. Rex rabbits are very soft and they feel like velvet. She likes to sit on your lap and be stroked. Her favourite food is carrots the same as Ivy. Sorry about the bad picture but she would not sit still. This is Bonny the day after we got her. 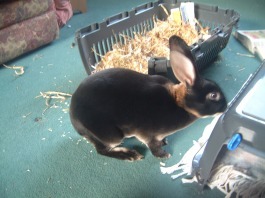 This is Paddy, we got him from a breeder in Bedfordshire called Annamarie who breedes rex rabbits and tri-coloured. Tri-coloured English rabbits are very rare, there are only about 4 breeders in the UK. He is a blue/fawn ( the colour of him ) He is really cute!! !